NIRMAL Lottery NR 62 Result 30.3.2018, Kerala Lottery result Today, 30-03-2018 Kerala Lottery Result, Nirmal Lottery Result 30.3.2018, Kerala Lottery Result 30.03.2018, Nirmal Weekly Lottery NR 62 Result March 30th, Nirmal weekly Lottery Result NR-62, Kerala NIRMAL NR 62 Lottery Result, NR 62 Result 30/3/2018, Nirmal NR62 Lottery Result, Kerala Weekly Lottery Result Today, Friday Weekly Lottery Result, Live Nirmal Lottery Today Results. Nirmal Lottery NR 62 Result of Kerala state Weekly Lottery 62nd draw (NR 62) will be held on 30-3-2018. Kerala Lottery Department will be published the Nirmal Lottery Result on 30/3/2018. Nirmal Lottery Result details, prize structure, Draw places etc are listed here below. Those who are taken the Kerala Government Lottery, Nirmal Weekly Lottery can check result of NR 62 when it is declared. Nirmal Lottery Result 30.3.2018 Updated Result : Nirmal Lottery is a weekly lottery conducted by Kerala Govt lottery department. 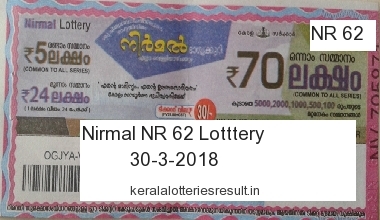 The Kerala Nirmal Lottery 62nd draw will be held on 30/3/2018. Kerala Lottery nirmal result and all other Kerala lotteries results are publishing on www.keralalotteriesresult.in after the official declaration of the results. Kerala Nirmal Lottery price is Rs 30/-. The lottery will be available in five series.